Why do we fly? Paragliding permits a human being to become like a soaring bird. Through adequate training and long term practice, a pilot will become one with his glider. There is no other experience in the world like this. We and the birds are the only creatures on earth who "see" the air and what it is doing on a micro-level. Imagine being able to fly through the air similar to hiking a trail in a beautiful forest. 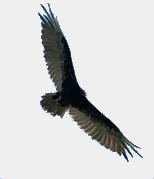 The glider becomes an extension of your arms – you become like a hawk, an eagle, or, better, like the Turkey Vulture, one of the greatest of soaring birds. We can teach you how. Here is a fine video production by Steve Crye showing the elements of why we love to fly. Paragliding, however, can be one of the most dangerous things anyone can do. If you think it is like golf or racket ball, please read this essay by Will Gadd on dangerous sports. Careful and extensive training is necessary to ensure that you enjoy paragliding safely. Southwest Airsports is an accredited training facility. Paragliding – Professional Air Sports Association (PASA) certified school #0023; U.S. Hang Gliding & Paragliding Association (USHPA) instructor certification. Powered paragliding – U.S. Powered Paragliding Association (USPPA) member and school #1672. For questions concerning our accreditation, you may contact USHPA 800-616-6888, USPPA 866-378-7772, or PASA. Southwest Airsports, LLC operates in accordance with all PASA Safety Guidelines and all PASA School Standards. Why have instructors that are well-trained in training others how to fly safely? This video may answer that question. C. What is the best type of school? Cross Country Magazine recommends that if paragliding pilots (not PPG pilots) want to be successful flying any course, they should become competent in mountain flying. We are experts in training pilots to fly in the mountains – it is our home turf. If you can safely fly in high altitude desert mountains, you can fly anywhere. Mike Robinson of Blackhawk Paramotors notes that teaching students on the coasts is "...like teaching someone to swim with a life jacket on the entire time." Our training is difficult and takes time – but it will help you become a safe and competent pilot. We are a small operation and provide only private instruction. It is like receiving musical instrument instruction in a private music studio alone with the instructor versus in a classroom full of students. The cost of the former is considerably more – and for good reason. Continuous attention by the instructor to the developing skills of the student pilot helps ensure the highest level of safety possible for an extreme sport like paragliding. Group lessons are typical for this sport and the cost will be less. Prospective students need to keep this in mind and what is the real value in the end. Do you want to have an extended and safe flying career? Safety is the #1 concern at Southwest Airsports. This sport is relatively young and we are constantly seeking ways to manage and lessen the risk of paragliding. We do our best to have a 1st class operation. Please refrain from the use of crude jokes and foul language while training and flying with us. D. Types of instruction PG or PPG? PG or PPG? If after reading the material below you have no idea of what to do, we suggest that you try one of the following: 1.) Visit a public rock climbing wall and try some rappelling (use Google to find one nearby). 2.) 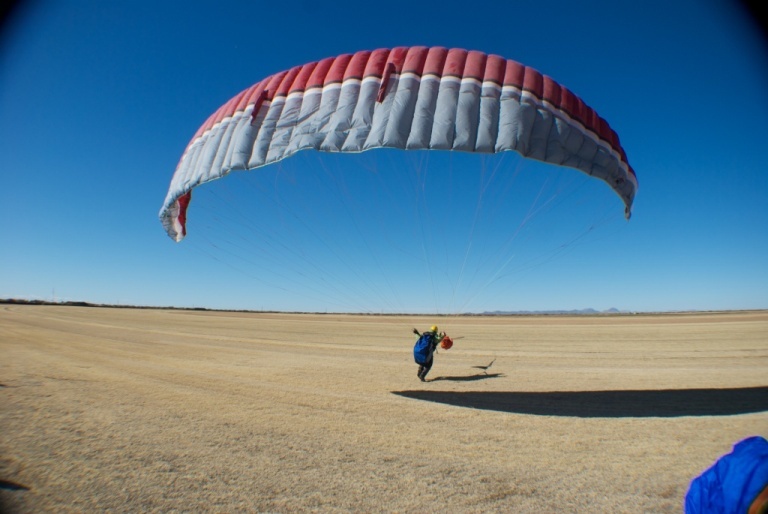 Take a tandem skydive flight with Sky Dive El Paso or a tandem flight with us. Activities like these will give prospective pilots some idea what it is like to be suspended off the ground, especially doing a skydive. PG is the more difficult to learn for the long term as a pilot must know how to launch from a hill/mountain or be towed up and know how to thermal. Knowing how to fly for hours without external power for long distances is a rewarding experience. Thorough knowledge of the atmosphere is critical for not only safety but success. Air is something we cannot see and when we successfully understand how it may work that day, its golden treasures are handily and generously given to us soaring pilots. Once in the air, you must find air that is going up and stay in it. You cannot choose as easily where you want to go nor where you may land. Thankfully, paragliders can land just about anywhere safely but it can be inconvenient. PG pilots must find a suitable mountain launch site and, if the air is calm or there is no air going up anywhere, he has to stay on the ground (unless he can be towed up). This means that the PG pilot must launch when the atmosphere is active (some hours after sunrise and before sunset). He often flies in thermals – and can get tossed around by them. PG pilots develop a tolerance for this "bumpy" air through practice. By thoroughly understanding the air we fly in, a pilot can reasonably predict how active the air is and choose to fly in appropriate conditions and not exceed his skill, equipment, or comfort level. We are an ultra light aircraft. "Ultra light" means what is says. We are like leaves in the air. The air is king and we respect it highly in order to fly safely. This is why thorough training and discipline are essential for a safe and fun flying career. We thoroughly train our student pilots. The course fees include instruction on how to be towed safely. Pilots will receive the "surface tow" special skills certification by USHPA upon completion of their respective course. Can you imagine cruising along (10) feet off the ground mile after mile? You are free of roads, trails, obstacles, and anything else on the ground. You can change direction any time and everything in the world is yours to see and enjoy. You can land and take off virtually anywhere. Only powered paragliding (PPG) offers such unlimited freedom. Here is an excellent summary from the EAA of what an ultralight (a powered paraglider) is and its legal operation. While it takes longer to initially learn than free flying, it has special rewards unique to flying the world's smallest powered aircraft. PPG can be done when the atmosphere is completely calm (early morning or late in the day) so a pilot can easily avoid the risks inherent with flying in turbulent air, the single factor which makes paragliding hazardous. PPG has the advantage, on the other hand, of allowing the pilot to launch, for example, from a field in still air. He can fly for many miles just ten feet "off the deck" – something a PG pilot cannot do. PPG pilots do not have to become experts in meteorological conditions in order to fly safely – they can stay out of active air completely. Some prefer not to hike to a launch site. Some do not like being more than 500' off the ground. (For a discussion of why this gives a false sense of security, read about flying low.) Others just like powered flight and want the convenience of launching, flying, and landing when and where they desire. Pilots endure the fuel expense, routine maintenance, the noise, and the extra weight and encumbrance for these advantages. Nonetheless, there are a few pilots (like the author of this article) who happily do both. It is possible to thermal with a PPG setup though it is not as easy. When PG is not possible because of the wind conditions (too strong, wrong direction, or not enough wind), or towing is not available, it is still better doing PPG rather than not to fly at all. PPG is generally done early in the morning or late in the day outside the time when thermals can be strong and when the possibility of turbulence exists. a. It is more agile (less total equipment weight) and easier to launch. b. The pilot can launch and land almost anywhere. c. The pilot can more easily launch and land in higher winds. d. It has a greater cruise range and climb rate with the same size engine and fuel tank. E. Rating systems for paraglider pilots – what skills will you learn? Here is an overview of the USHPA rating system for pilots. Go here for a complete reference. PPG has the added distraction (!) of a paramotor, especially when launching. Here is the USPPA rating system for PPG pilots. It is mandatory to have the appropriate textbook to study while training and to use as a reference. They can be purchased on Amazon. All basic flight training is done at the Evergreen Turf farms in Santa Teresa, NM. We are visitors to the farms and we greatly appreciate the owners permitting us to use the farms. Directions can be obtained by clicking on the link above. Ground school is done at various locations in Santa Teresa, NM. H. What should I bring to training? All basic training is done via towing at the turf farms in Santa Teresa. Follow the preceding link to read how and why we do it this way. Here is a typical tow at the turf farms of both new and more experienced pilots (video by Steve Crye). We also do recreational towing on Hwy 9 in southern New Mexico. A paraglider is like an ordinary kite that a youngster would fly in a breeze. It is not some sort of parachute, even though it has somewhat the appearance of one. It is a true airfoil like the wing on an ordinary aircraft and moves through the air at about 21 mph. It has a glide ratio (distance traveled vs. rate of sink) of about 10:1 or less, depending on the design. This means it can go 1,000' through the air and sink just 100'. The main difference between an ordinary wing on an aircraft and a paraglider is that the paraglider is flexible, being made of special fabric and that we hang, like a pendulum, from the airfoil. Hanging from the glider gives pilots a great amount of passive safety compared to any other aircraft. The downside is that it does not handle turbulent air nearly as well as, say, a hang glider. The wing fabric is very strong and non-porous. Because it is made of fabric, the wing must maintain its proper shape. This is done by a greater air pressure inside the wing than the (ambient) pressure on the outside. In this way it is like a hot-air balloon. This greater pressure is created by openings (ram air scoops) in the leading edge of the wing. When the glider is flying along, these ram air scoops insure that the interior parts of the wing will be pressurized enough to assume the shape of an airfoil. Because the wing is made of fabric, it can collapse under certain conditions. It is usually a benign event. However, collapses can be extremely dangerous near the terrain (< 300') why pilots must be exceedingly careful! Dozens of lines connect the glider to the pilot's harness which hangs about 25' below. This distance is kept to a minimum in order to keep drag to a minimum. Some of these lines are used to control the glider's movement through the air. Briefly, these lines allow control of the wing in essentially every way that is done on an fixed wing aircraft. A paraglider changes direction by inducing drag on one side of the wing or the other. For a paraglider to stay in the air for long periods, pilots must find air that is moving up – often a great challenge. Air moving up can be thermals created by the sun's heating of the ground and the air near it or air moving up at ridges. The air comes in horizontally, hits the ridge, and then moves up. We fly in that air because if we are not in air that is moving up, we will descend towards the terrain. The air must be moving up at least 200'/min for us to stay up. However, if we have a motor (paramotor), we do not have to launch from a hill or cliff and can stay up as long as we have fuel to run the engine. Launching with an engine running full speed while on foot can be complicated and requires additional training to do it safely. A paraglider, unlike all other aircraft, is inherently stable. With absolutely no input it will fly straight and level. The benefit of this is that it makes it very easy to fly. If a new pilot training at the turf farms is doing something incorrectly, all the instructor on the ground has to do is say, "Hands up!" – and all will be well. The downside of the paraglider is that is very sensitive to negative G's. That is, air which is descending faster than the glider is sinking through the air will cause the glider to collapse. This is why good pilots are always very cautious about the air they fly in. It is impossible to safely fly a paraglider unless that pilot becomes knowledgeable about the air he flies in. Launching a paraglider is fairly easy and is done exactly the same way you would launch a kite except you are directly attached to the kite and you have to run fast or slow, depending on the ambient conditions. Landing is similar. The pilot comes in and flares the wing by pulling deeply on the brake toggles (handles) just before he touches the ground to both make the landing gentle and to slow the glider down. The trouble with us humans is that we are mono-planar, unlike the fish or birds, so when we come in for landing, we think we are falling and tend to mishandle the glider. Our natural fear of heights needs to be overcome as much possible but it will never happen completely. Flying any aircraft is a perishable skill and why constant and thorough training is essential to having a safe and enjoyable flying career. If you do not have the time to practice regularly, this sport is NOT for you. Optional – Here is a more technical guide from TowMeUp.com on how our aircraft works. What if I am afraid of heights? It depends on how serious your anxiety is. Most people (including this writer) are naturally afraid of heights but can largely overcome it with time and practice. It is common with human beings to become more fearful as they get further from the surface of the earth, their home. Actually, all pilots should feel just the opposite from a safety standpoint. Being close to the earth, but not on it, is where we always experience the greatest risk. Being 40' off the ground is much more dangerous than being 4,000' off the ground because at the higher altitude we have far more time to fix problems. Mental stability and control under pressure are important qualities to have if you wish to successfully pursue training in this sport. If you easily panic, sport aviation is not for you. Sensory overload (task saturation) is a serious problem for all pilots, new or experienced, and is why constant and regular practice is necessary. The more tasks we can do automatically (like learning how to ride a bicycle), the more mental capacity we have to focus on important things while flying such as obstacles around us and any kind of mishap while in the air. At no time is this more true than when launching and landing. No pilot can ever be good enough at these skills. Below a student pilot begins a flight via tow. The orange drogue and tow line are just visible in front of the pilot. The turn around pulley through which the tow line runs is mounted on a truck over 1/4 mile away. What a place to train – it is safe and easy to land anywhere. Photo by Daniel Dominguez. A student pilot coming in for a landing. She is gliding along at about 18 mph and will gently touch down on the ground in about 10 seconds. Lee Baker being towed up to 9,000' MSL on Hwy 9. The white dot near the tow line is the moon. The vehicle behind us is our "chase" vehicle. A student pilot comes in for a safe landing at the turf farm after her training flight. Women make good pilots as they often understand finesse better than men. Paragliding requires gentle and measured inputs to the wing – anything else can be dangerous. Hooking up to the tow line. The orange drogue parachute is connected to the tow line. It helps us find the end of the tow line after the pilot disconnects in flight. Pilot safety is our primary concern and everything is done with that in mind.